Not much to say this month, old friend. A combination of building work in the house (I’ve built a boiler room to house our new biomass boiler amongst other things) and having to trek down to Devon to sort out Mother-in-law’s move to sheltered accommodation have meant I haven’t spent as much time tidying and doing the spring work that’s needed here in Old School Garden. Having said that, Deborah has been a great help in weeding and tidying up. I have also been spending some time at Gressenhall and Blickling doing voluntary gardening, so I suppose that I’ve been gardening all the same…. The grass has had its first couple of cuts, with newly serviced mowers, but also showing the clear signs of several years of mole damage! I’m also pleased that my new shed – to be used to house the mowers and other outside power tools etc. 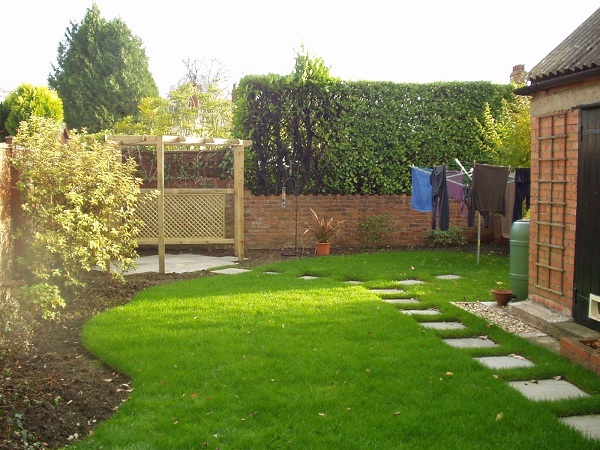 – is up and looking very neatly slotted into a corner of the rear garden. This was prompted by the conversion of some of the garage into the new boiler room, but it also makes for a better all round use of the various storage spaces we now have. What else to tell you about in the garden? Well, the Melianthus has finally broken into flower and I’m pleased that I resisted the temptation to cut it down before it had the chance to do this. The only issue now is that it’s grown rather large and may have to be moved to a more suitable spot- something for the Autumn. Other ornamental areas are starting to fill up with greenery and flower colour rather nicely too, and we are just about holding our own- as usual- in the fight with the ground elder. I’m managing to get the propagation production line going too, using a heated propagator inside the house, moving then to the greenhouse, then to cold frame and finally hardened off outside before planting out. I’ve just put out some French Marigolds into the kitchen garden along with some Calabrese. These are sitting alongside some autumn sown onions, broad beans and garlic (the latter hasn’t yet made a show above ground). The Early potatoes have yet to put any growth above ground, but recent rain may help with bringing them on- we’ve had a period of settled, warm and dry weather here, the dryness rather holding some things back, I think. I’m making progress with the new pond, though there’s still a lot of soil to shift! Still I’ve got the big Silver Birch stump and an Elder out, and so created the start of some deeper holes in the pond area. I bought some shrubs a week or two ago and have earmarked some others I already have in pots, so the planting should get off to a good start, when I eventually get round to it! I ‘ve also got hold of some spare underlay so that will help with costs. The pond area – with Silver Birch stump removed! Some of the soil from the pond area is going onto an adjacent spot previously planned for the new shed, my new ‘spring garden’. I’ve levelled this off and its getting ready for planting, though this will probably be in the autumn. I think it was this time last year when I was reporting on the pruning I’d done in mother-in -law’s garden in Devon and I’m amused to find that I’ve almost repeated that in the last few weeks, with 14 bags of prunings and weeds to be taken away by the Council! As you read this I’m down in Devon once more, for another bout of tidying and sorting, in anticipation of selling her house and moving her to more suitable accommodation. As I mentioned above, I’ve been over to Gressenhall a few times and seem to have made an impact on tidying up and pruning- I tackled the ‘Rambling Rector’ there this week, so that should keep it in check for another year. The deepened entrance border is looking good with its selection of Narcissus and Tulips set off well among the grasses and Lavenders , which will put on their show later in the year. I’m also gearing myself up for a possible new Garden Design course in the autumn, talking of which I went to the local high School’s Music event a few days ago (Deborah is a Governor there and is in the choir). I was approached three times by women who looked familiar, but who I couldn’t immediately place. They all turned out to be former students on my ‘Grow your Own’ and Garden design courses! It was good to catch up with them and hear of their progress and obvious enthusiasm; and warming too as they seemed to appreciate the work I put in for them! So, another month gone, and almost May. When I return from the West Country there’ll be plenty of catching up to do, and hopefully not too many disasters- hopefully the neighbours will be on watering duties, an especially important task at present with so much new growth in the Greenhouse, Cold frame and Garden. I hope all’s well with you and Lise and that you’re managing to get out and about in your garden at this busy time. I’m certainly behind where I should be here at Old School Garden. I’ve weeded and dug over about two-thirds of the borders here and managed to mulch the fruit with a mix of horse manure and compost. I edged the lawns for the first time the other day and then cut the grass – all in all it took me about 4 hours! Still it does look the better for it. Apart from being behind with the weeding etc. everything elses is pretty much on track. The greenhouse and cold frame (as well as the lunge window sill) are packed full of seed trays and seedlings at various stages of growth. I’ve tried experimenting with a mix of multi purpose compost as a base layer and then some John Innes seed compost on top to get the seeds started; I’m still not very happy with the John Innes, as it seems to get water sodden and so not very healthy, quite quickly, whereas the multi purpose is not really fine enough for the really small seeds. I shall have to try further mixes. The flower borders are starting to fill out very nicely, and I’m just about to mulch these with old wood chips and put in staking for the larger perennials. The bulbs and other spring flowering plants are also making a good show at present, though I’ve been disappointed with the tulip bulbs I bought in Amsterdam last November. Only one of the three packs I bought has come up as expected, the other two being nowhere close to the blue or violet colours promised on the packaging. So, the best laid colour mixing plans have gone out of the window and I’ll have to rearrange these in the autumn. The other, more established tulips are looking grand; I’m especially pleased with the way some old cast offs from Peckover House, planted 18 months ago, have responded to their new situation. They are flowering very well in the sandier soil here, perhaps evidence that you can leave tulips in this sort of soil, but in heavier soils they tend to shrivel up and rot- the soil here is a lot more sandy than the siltier, clayey material in Wisbech. Food crops are coming along, and I managed to spot the stem of an artichoke the other day (just one! ), so the roots I put in last autumn may have not been a complete write off. I obviously miscalculated the amount of seed potatoes I needed, as I’ve ended up with s ix rows instead of the planned two! So, the kitchen garden plan has already had to be amended! Anyway, most of the beds are full of growth now; broad beans, mangetout peas, chard, lettuce,chives, calabrese, cauliflower, red cabbage, spinach, carrots, onions and garlic as well as the potatoes and more permanent beds of fruit. So far so good (and pests seem to be under control)! We recently visited my mother-in-law in Devon and I spent a good day or two pruning back a number of over grown shrubs. The cuttings amounted to about 10 big bags, so I must have made an impact! As you will recall, her garden is on a steep slope overlooking the edge of Tavistock and farmland beyond. A lovely setting, but a garden that is just too much for her to cope with now. She does get some gardening help, but this seems to amount to grass cutting and not much more. You may have gathered that whilst there we managed to visit several lovely gardens and other places, so keep an eye out for more articles and photographs in the next couple of weeks. I’ve continued with my work with the three groups of students at Fakenham Academy and am pleased to say that the three plots are now starting to fill up- we’ve planted a lot of potatoes, some beetroot (grown by the students from seed) and in the next couple of weeks we’ll be sowing and planting a lot more. Hopefully this activity will start to generate more enthusiasm in the students who, to be fair have had not much more than digging to keep them occupied up to now. On Thursday I also begin work on a planting scheme for a border in the grounds of the community centre at Fakenham. This is backed by a lovely old ‘crinkle crankle’ wall which is over 200 years old. The first job- with volunteers assisting I hope – is to clear the majority of the borders of an invasion of Borage and other plants and then to measure up and start to consider a planting plan. The local primary school is also getting involved and we hope to complete the project by the end of May. I’ll do some articles and pictures about this as it progresses. The Cawston School garden is also looking full, though I haven’t been there for a few weeks, so it must be in dire need of weeding! I think I may have told you that the School has now not only achieved the highest grading in the RHS Campaign for School Gardening (level 5) but has also achieved a gold standard in the broader ‘learning outside the classroom’ that they do. On that note I’m giving a presentation about education for sustainability at a national network of early years landscape professionals tomorrow, and hope to cover a wide range of projects that I’m involved with. I’ll let you know how it goes- I’m particularly looking forward to seeing the outside environment at the Earlham Early Years Centre in Norwich where the meeting is taking place- must remember my camera! Work to promote my forthcoming courses has been progressing and I’m going along to Gressenhall Farm and Workhouse Museum for its ‘Going Wild’ event on 5th May to conduct a couple of garden tours and promote the Wild life Gardening course there on 18th May. I’m not yet sure about the numbers signed up for this or the other two courses that are scheduled to begin in early May. Both of these are in the evening at Reepham High School and College and once again I’m covering garden design and growing your own food. Fingers crossed I get the numbers that mean they’ll go ahead. Well, this is obviously a busy time and so far today I’ve spent the morning on the computer and occasionally looking out at the weeding still to be done and all the other jobs in the garden, so I must get moving! Bye for now, old friend, and all the best until I write again in a few weeks time.